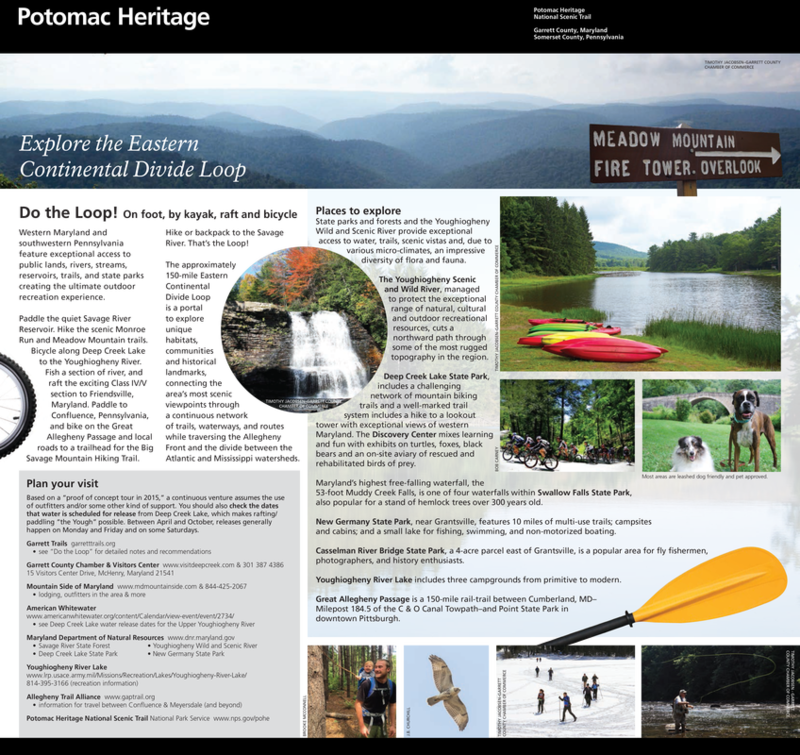 On my last day as Executive Director of Garrett Trails I'm preparing for the inaugural traverse of the 150 mile Eastern Continental Divide Loop (ECDL) Trail. Having spent many hours over the last year negotiating a new route for the trail that all stakeholder's can agree to I want to be the first to "Do the Loop" as a proof of concept trip. This trail has been in the conceptual planning for more than 6 years and while many involved have traversed segments of it no-one has ever attempted the whole loop in one single adventure. Over the next week before I start my new job at WVU I plan to break the ice and see what can be done on this multi-adventure trail, ~ 30 miles of paddling, 40 miles of hiking and 70 miles of bicycling lie ahead. While campsites and lodging allow for doing this trip as one continuous adventure I plan to do the light version by doing it in 7 consecutive days of day trips. Along the way I've planned some stops and photo ops with outfitters and trail supporters who can make your adventure of the ECDL possible in the future. The primary determinant of where you start is what day you can go down the Upper Youghiogheny Class IV-V rafting run. Releases are usually on Mondays and Fridays in the summer with some Saturdays. I've booked on with Precision Rafting in Friendville, MD for Monday, July 20th. 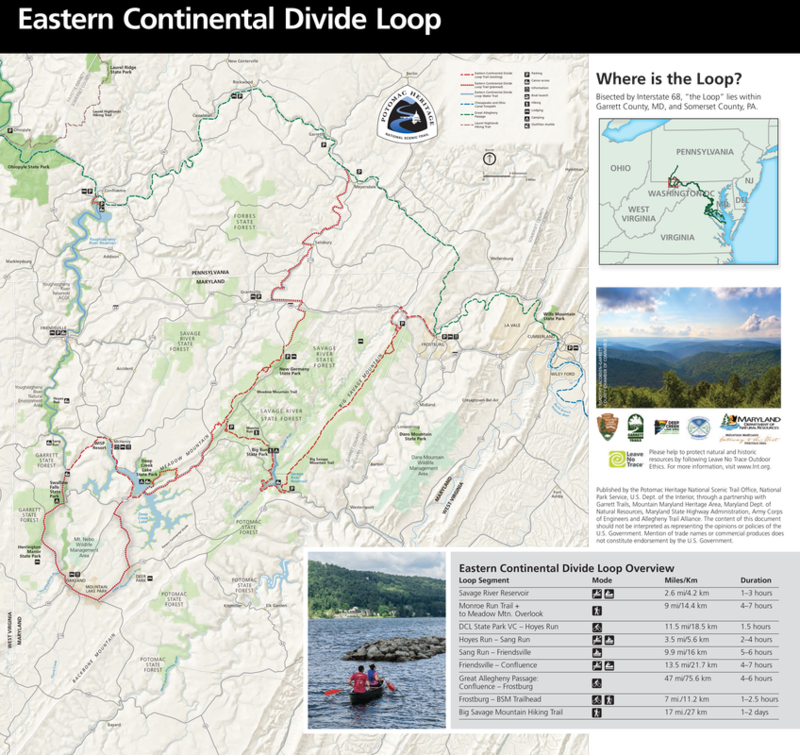 In order to accomplish the loop in a week starting this Saturday I will start and end at the Savage River on the Eastern side of the Eastern Continental Divide. This will get me to the Upper put-in in time to join Roger Zbel and his staff for one of the best whitewater runs in the country. Look forward to updating you as the trip takes shape. See you on the Trail! Day 1: Savage River to Rt 495 (~14 miles) 1 mile hike to top of dam, 3.5 mile paddle across Savage River Reservoir; 5 mile hike up Monroe Run Hiking Trail; and 3 mile hike along Meadow Mountain Trail including the newly constructed overlook segment to 495. Day 2: 495 to Hoyes Run (~19 miles) All bicycle day 5 miles on trail and 14 miles on roadways. Includes a chairlift ride up Wisp Mountain and some single track in Fork Run Recreation Area. Day 3: Hoyes Run to Friendsville (~12 miles) 3 mile moving water paddle in the am and then a commercial raft trip with Precision Rafting down the famed Upper "Yock"
Day 4: Friendsville to Confluence (~14 miles) Sea kayaking across Yough Lake. Day 5 & 6: Confluence to St. John's Rock (~49 miles) Bicycling along the Great Allegheny Passage (GAP) with a night in Meyersdale, PA and getting off in Deale, PA to head south to the start of the Big Savage Hiking Trail. Day 7: St. John's Rock to Savage River (~17 miles) Hiking the remote and rugged Big Savage Mountain Hiking Trail back to the starting point.